Ballon is a French term used especially in ballet, describing a dancer who appears to be floating in the air while executing a jump or other movement, like “His Airness,” Michael Jordan. Earlier English spellings of the word include balonne, baloune, and balloone as well as balloon. The original sense of the word in the early 17th century was “ball,” specifically a large, sturdy, inflated leather ball hit with the arms protected with wooden boards or kicked like a soccerball. By the late 17th century ballon and balloon had developed the meaning “a large globular glass vessel” used for chemical distillation; and by the late 18th century, balloon (thus spelled) also meant “a round, flexible, airtight bag that rises into the air when inflated with heated air or gas.” Balloon becomes the standard English spelling in the late 17th century. Ballon, as a ballet term, entered English in the 19th century. So, ballon in ballet is about floating on air, and balloons? Well they are floaty orbs, unless they’re filled with water or made of glass. I got the impression that the original balloon was more about its shape than its floating qualities. And then I started to think of round, inflated ballerinas bursting at the seams of their leotards, tutus stretched tight and stiff around their middles, and I couldn’t help but giggle. Which came first the ballon or the balloon? The latter, of course. 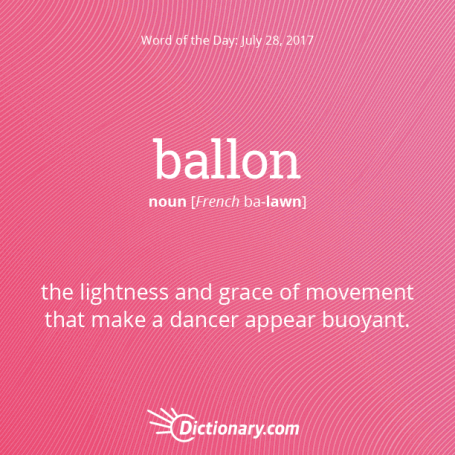 Ballon, in ballet, entered the English vocabulary rather late to the dance in the 19th century. We humans had been filling animal bladders and other hollow bulbous things for centuries. Somewhere between heaven and earth the idea of floating on air became associated with balloons and voila! We now have ballon to help us describe the amazing acrobatic, gravity-defying leaps of ballerinas. Being inflated and puffy not required! I’m feeling silly today. I best give you my Haiku. Have a great weekend! This entry was posted on Friday, July 28th, 2017 at 9:54 pm	and tagged with ballon, dictionary.com, Haibun, Haiku, Poetry, word of the day, word prompt and posted in Essays, Haibun, Haiku, Poetry, Random Thoughts and Musings, Word of the Day Haiku. You can follow any responses to this entry through the RSS 2.0 feed. I wonder if ‘baloney’ has the same origin …. facts that one inflates through imagination, and then, loses control on the movement. Thanks! Will use these links. Thanks for teaching me a new word. Very interesting.